The US economy continues to grow at a lackluster pace. Indeed, since Q3-2009, when the recovery started, through Q3-2012, real GDP is up just 7.2%, weaker than all of the previous six recoveries, which had an average gain of 15.8% over the comparable 13-quarter period. Real consumer spending is up 7.4% during the current recovery, also weaker than the previous six and well below their average gain of 14.5%. The negative spin on this subpar growth from the Bear camp is that it’s very close to “stall speed.” So they’ve been predicting a “double-dip” recession ever since the bull market started in March 2009. Now they are licking their chops about the fiscal cliff, which will certainly cause a recession, if it isn't averted. I have spotted a few “soft patches” in the economy during the latest recovery, but insisted that GDP would continue to grow. Now I am predicting a “Second Recovery” for the US in 2013, led by housing and autos. I see lots of pent-up demand that could boost growth next year. I think this could happen no matter who wins next Tuesday. Admittedly, I feel more strongly about this outlook if Romney beats Obama. As discussed on Monday, I think this is a likely outcome despite the neck-and-neck polling results. However, in either case, the lame-duck Congress will probably pass an omnibus bill postponing all aspects of the fiscal cliff for one year. Postponing it for a shorter period would pose a nightmare for the IRS and for taxpayers having to prepare their 2013 returns with two different tax rates. For now, the fiscal cliff is already weighing on the economy. The 2.0% (saar) increase in real GDP during Q3 was better than Q2’s meager gain of 1.3%. However, the latest quarter’s growth was boosted by a 9.6% increase in federal government spending, mostly on defense. Without that contribution, real GDP would have been up only 1.3%. Needless to say, the stall-speed crowd was fast to make this point when the numbers were reported on Friday. (1) World crude oil usage rose to a record high of 89.5mbd over the 12 months through September. While “Old World” demand remains depressed, “New World” demand rose to a fresh record high. The latter now exceeds the former by 39%; March 2005 was the inflection point where New World began to exceed Old World demand. (2) The y/y growth rate of world crude oil demand fell to a recent low of 0.3% during March, but has edged up to 0.8% as of September. The growth rate of oil demand among the non-OECD economies has stabilized recently around 2.5%, while the growth rate for the advanced economies of the 34 members of the OECD is up from -1.7% y/y during March to -0.8% during September. That’s mildly encouraging and suggests that the recent weakness in the OECD’s Leading Economic Index may be short-lived. (3) I previously have noted that data collected by OMI on world oil demand and supply are estimated using different methodologies and aren’t strictly comparable. However, the ratio of the OMI’s demand and supply series (based on the 12-month averages of each) is positively correlated with the yearly percentage change in the price of a barrel of Brent crude oil. The normalized ratio fell to 0.99 in September, the lowest since June 2009. That's bearish for oil prices, suggesting that only fears of a war in the Persian Gulf are propping them up. Where in the world is inflation? I’ve asked the question many times before. Despite the enormous amount of liquidity pumped into the global economy over the past few years by numerous central banks, inflation remains remarkably subdued around the world. Maybe governments are tampering with their measures of inflation so it is understated. If so, then it must be a widespread global conspiracy since so many inflation rates are so subdued. On the other hand, a few of those governments, particularly the central banks of the United States and Japan, have said that they would like their policies to boost inflation in order to reduce the risk of deflation. The most plausible explanation for why inflation remains so low is that the central banks so far have succeeded in offsetting, but not eliminating, some very powerful deflationary forces. On our website, we regularly update our Global Inflation chart book. August’s core CPI inflation rate on a y/y basis was only 1.6% among OECD advanced economies with the G7 rate down to only 1.4%. In September, this inflation rate was only 2.0% in the US and 1.6% in the euro zone. Inflation is higher among many of the emerging economies. However, many of them have a history of chronically high inflation. In other words, it’s hard to pin the blame for their inflation rates on the monetary easing of the past few years. The latest headline CPI inflation rates are high in some of the major emerging economies, like India (10.1%), Indonesia (4.5%), Brazil (5.6%), and Mexico (4.8%). On the other hand, it is only 1.9% in China. If you are looking for out-of-control inflation in the US, look no further than the college and hospital next door. The CPI data show that college tuition and fees have increased 1,036% since January 1979 vs. 546% for Medical Care Goods & Services vs. 238% for the overall CPI. In other words, college costs have more than quadrupled relative to the CPI over this period, while Medical Care has more than doubled relative to the CPI. We all have explanations for why health care costs are out of control. I’ve talked to lots of doctors about it, and they all agree that tort reform could lower those costs by 25%! Just ask your doctor. What about college costs? I blame Elizabeth Warren, who is running as a Democrat against Sen. Scott Brown in Massachusetts. She is a professor at Harvard University. She gets paid $350,000 for teaching one course, and has a lucrative consulting practice. She is not unique in this respect, as reflected in the CPI for college tuition and fees. (1) The group’s stock price index is up 182% since March 9, 2009, when the bull market began. 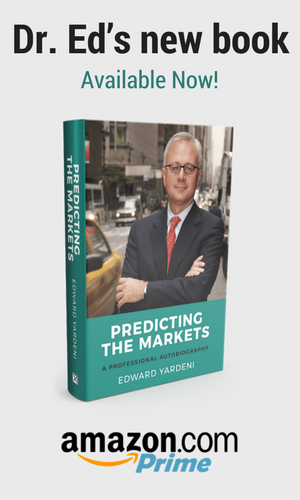 It has significantly outperformed the S&P 500, which is up 111% since then. (2) The group’s forward earnings rose to a fresh record high during the first week of October. Industry analysts are expecting that the group’s earnings will rise 16.1% next year following a 10.2% gain this year. (3) Last week, the group’s forward P/E rose to 18, a level that has proven to be a lid on valuation since the start of the bull market. However, that doesn’t mean that the stock price index can’t continue to move higher as long as retail sales and forward earnings continue to do the same. It just might not continue to outperform the overall market by as much. China's 12th Five-Year Plan for 2011-2015 aims to transform the economy from export-led growth to consumer-led growth. 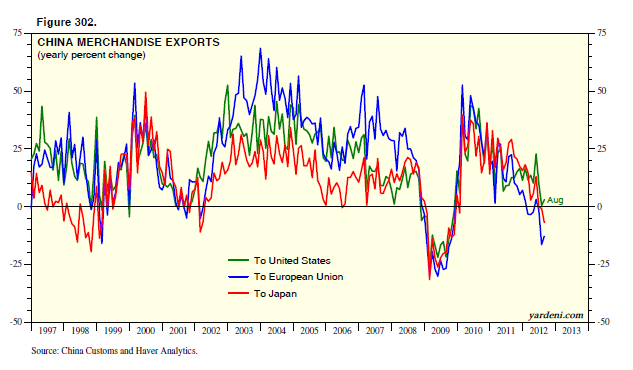 The problem is that China’s exports have been hard hit by the slowdown in the global economy. As a result, China’s leaders are in a panic as they realize that they have much less time for making the transition from export-led growth to consumer-led growth than they expected. Their immediate response has been to raise minimum wages, which is worsening the weakness in exports by raising labor costs. Tokyo's recent decision to buy contested islets in the East China Sea infuriated Beijing, prompting widespread demonstrations in China and a boycott of car and other brands made in, or by, Japan. Nationalists in both countries are inflaming the tensions between the two nations. Over the past 12 months through August, China exported $153.1 billion of goods to Japan and imported $186.7 billion. Those trade flows are already getting hit by the dispute as Japanese auto sales are plummeting in China. Last month, a Chinese driver of a Japanese car was left partially paralyzed after being beaten by an anti-Japanese mob. People have been debating over social media the risks of purchasing a car from Japan. Toyota said it sold 44,100 vehicles in China in September, down 49% y/y. Nissan said its sales in China fell to 76,066 vehicles last month, down 35%. Honda reported a 41% drop to 33,931 vehicles. 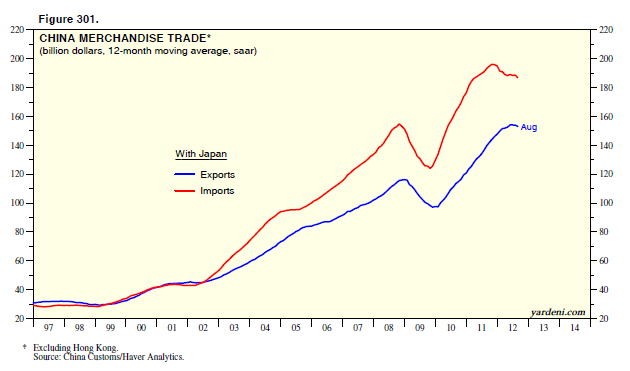 This is also depressing the production of Japanese companies that assemble cars in China. As a result of the political tensions, the three biggest Japanese car makers temporarily closed their factories in China during September. Production remains below pre-crisis levels, with Nissan saying it is operating plants "flexibly" to respond to changes in demand. Industry analysts raised their S&P 500 revenues estimates at the end of September for both 2012 and 2013. Their estimate for next year peaked at $1161 per share during the week of April 26, falling to a low of $1124 during the week of August 16. It then stabilized over the past six weeks around that low, and hooked back up to $1131 at the end of September. Could it be that S&P 500 revenues, with more than half coming from abroad, are bottoming despite the IMF’s increasing caution about the outlook for the global economy? Furthermore, S&P 500 forward earnings rose to a new record high last week of $112.82. In recent weeks, industry analysts continued to lower their Q4-2012 estimate, but at a slower pace, and it also might have bottomed last week. They’ve recently stopped lowering their estimates for all four quarters of next year. According to September’s controversial household survey data, employment rose by a whopping 873,000, with the labor force up 418,000 and unemployment down 456,000. Monthly gains of 500,000 or more in household employment are rare, but there have been eleven of them in this volatile series since 2000. They are often followed by sharp reversals in the next monthly report. The employment gain was attributable to an increase of 838,000 in full-time employment, while part-time employment fell 26,000. What’s odd is that among those working part-time (which edged down slightly), there was a 582,000 increase in those working part-time for economic reasons. In other words, lots of people found full-time jobs, and lots of people who wanted to work full time could only find part-time jobs. Got that? Even odder is that the payroll survey showed that employment in the temporary help industry edged down by 2,000 in September. While I doubt that anyone at BLS tampered with the household data for political motives, I’m certain no one even thought to bother with the payroll employment numbers. September’s increase was a measly 114,000. I give much more weight to the revisions to the previous two months, which tend to be upwards when the economy is expanding. They totaled 86,000 during July and August, raising their monthly average gain to 161,500. The oddity here was that upward revisions occurred at the local-government level--mainly the hiring of school teachers (up 77,000)--which nearly matched the revision to overall payrolls. The really good news in Friday’s report was that aggregate weekly hours in private industries rose 0.4% during September to 3.85 billion hours, the highest since November 2008. In addition average hourly earnings rose 0.3%. As a result, our YRI Earned Income Proxy, which is highly correlated with the private sector’s wages and salaries in personal income, jumped 0.7% to a record high. This augurs well for the holiday shopping season. There are only 77 days left before Christmas! The debatable question is whether the Obama administration’s policies are creating jobs. The answer, of course, is they didn’t create them. Mitt Romney says he’ll create 12 million jobs if he is elected to be the next president. Presidents don’t create jobs. Profitable companies expand and create jobs, especially small ones that turn into big ones. Will the Europeans ever get their act together? In last Thursday’s FT, James Mackintosh observed in his column: “Every time Europe’s leaders are given a breathing space by the European Central bank, they return to their petty disputes and progress stops.” While they ceaselessly debate about how to keep their monetary union from disintegrating, the stress on the euro zone’s economy is worsening. On Thursday, the ECB released data showing that monetary aggregates continued to grow in the euro area, with M2 up 3.2% y/y through August. 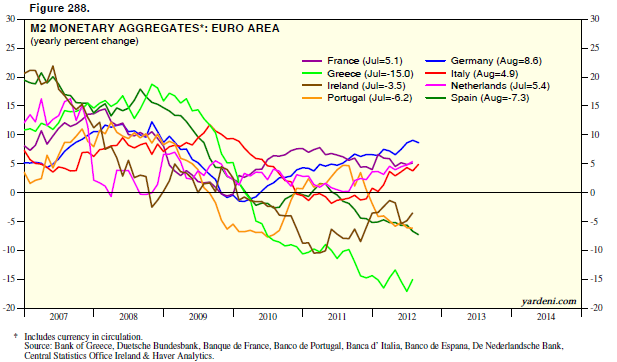 However, M2 growth was negative in Spain (-7.3%, August ), Greece (-15.0%, July), Portugal (-6.2%, July), and Ireland (-3,5%. July). 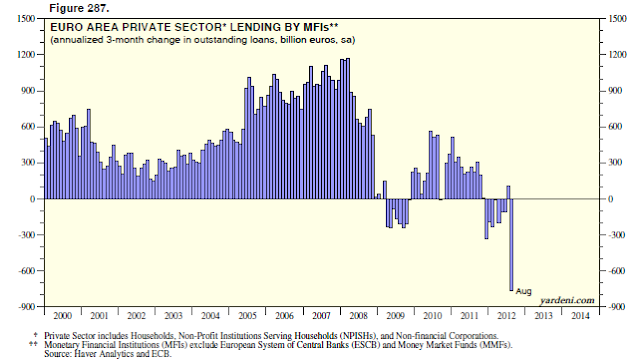 The ECB’s data also showed that lending by monetary financial institutions (MFIs, excluding central banks) to the private sector plunged by €766 billion (saar) over the past three months through August. That was mostly attributable to a big drop in loans by MFIs to other financial institutions. Now we know why ECB President Mario Draghi felt compelled in late July to promise to do whatever it takes to save the euro.